I don't write about aliens, although one day I may give it a try, but I love a good story about the supposed actions and motivations of planet Earth's alien visitors. They reguarly kidnap us ("us" being almost exclusively North Americans) and exhibit an extraordinary fascination with our rectums; they fly physics-defying craft over our planet for no apparent reason; and they use our paddocks as canvases for their art. Patricia Altner interviews Ann Aguirre on her blog today. I read Grimspace, the first book in Ann's science fiction series about a "jumper", Jax, who navigates ships through grimspace (aka subspace, or what I call nodespace in my book), last year. It's a futuristic adventure romance novel that I was really excited to find, because at that time Kristin was shopping my book to publishers and Grimspace was one of the best examples of a book that was a similar genre to mine (meaning, "if you liked that, you'll love this!"). Plus it had a cool cover. It's published by Penguin Ace, so we had high hopes for that editor. She said of Song of Scarabaeus: "It's solid and the author has talent... I enjoyed the writing," but rejected the book as being "too technical, with more science than I was looking for in an SF novel with romantic elements." Definitely one of my nicer rejections, especially because I was aiming for a book that includes plausible science as an integral part of the story and the worldbuilding. I majored in cell biology and zoology (eons ago) and read Scientific American and Stephen Jay Gould for pleasure. Science, particularly biology and physics, fascinates me. I had great fun inventing a new science for Song, extrapolating from what I know about ecology, genetic engineering and retroviruses. Having said that, my focus is always on the characters and the story - which is what I enjoyed about Grimspace, with its fast pace and lively dialogue. It's written in first-person present tense, which takes some getting used to but works really well. There will be four books in the series (book 2, Wanderlust, is already on the shelves) so check it out. I love Priority Mail envelopes, with their desperate little stripe that screams, Open me! Now! I got here in a hurry and I'm exciting! I received an exciting-looking Priority Mail envelope today and I opened it in a hurry. It was from my agent. It had a check inside. My advance has arrived! (Well, half of it.) Actually, it may have come yesterday but did not scream loud enough, and I forgot to look in the mailbox because I was preoccupied with a million things to do around the new house, like shuffling furniture and unpacking boxes and putting this thing here and that stuff there so I can tame the obstacle course that aspires to be my living room. So now I have an advance and a signed contract. The IRS is involved. I feel like a "real" writer... and I haven't had time to write a word all week. Here in Tucson, the night sky is an awesome sight. Thanks to the presence of the Kitt Peak Observatory just outside town, many suburban streets do not have street lighting - which means we see a lot of stars. When I moved here a few years ago from the other side of the globe, the first thing I noticed (after the absence of the Southern Cross) was that you can always see the entire moon here, even when it's a crescent. Its full shape is always visible as a circular shadow. I'm terrible with constellations, but Orion is hard to miss - and it's visible in both hemispheres. I've learned to pick out a few more constellations now, as well as super-bright Venus and red Mars. Living near both an airport and an Airforce base, we do of course see a lot of UFOs at night. It's fascinating how viewing an aircraft from different angles and altitudes, under different conditions such as cloud cover and other obstacles, can have such a major impact on your perception. Tonight while walking the dog, we saw the most amazing shooting star. A green fireball exploded across the sky, trailing flames, then turned white and continued on like a flare. It covered a much larger arc than a typical shooting star and lasted about four seconds. It lit up the neighborhood. Incredible! Bring on the scientists: The American Meteor Society website says that a green fireball means the meteor contained nickel. Today while packing I came across my old school exercise books from infant school (grades K-2). 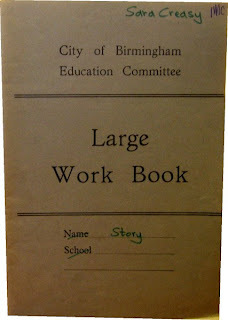 These attractive grey books were issued by the City of Birmingham Education Committee and came in various sizes, lined and unlined. We wrote in them our news and our creative writing efforts. In second grade I wrote in my News book, "When I grow up I am going to marry Andrew Cull he is my boyfriend." I don't think Andrew Cull knew about this plan. I wanted to be a teacher and teach "good children" who "are never going to the head teacher for a smake." Those were the days when smacks, wallops and canings from the head teacher weren't illegal. I wrote, "I wonder if I will like it when I grow up." 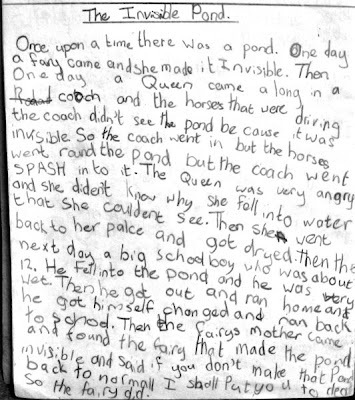 My second grade Creative Writing book includes stories with titles such as "The Ghost Ship," "The Magic Garden," "The Magic Shoes," "The Island of Magic," "The Island of Tiny People," "The Land of the Funny Faces," "The Day I Was Lost" (told from the point of view of a penny) and "The Invisible Pond," in which a fairy makes a pond invisible and the royal coach drives into it, angering the Queen. The fairy's mother admonishes the fairy with: If you don't make that pond back to normal I shall put you to death. The fairy complies. If I ever run out of ideas, I could go back to my six-year-old self and see what she comes up with. Today I learned who my cover artist will be (I don't actually know if I'm allowed to say, so I'll hold it in for now). I checked out his website and... I'm floored. His work - mostly urban fantasy and science fiction - is absolutely amazing. His style is gritty and moody, his characters are gorgeous. I'm so excited to see what he comes up with for Song of Scarabaeus. Remember Jump? Not Van Halen, but the Pointer Sisters. It was playing in the car this afternoon and while it's a corny song, it's also a nostalgic one for me. Made me think about how music, good and bad, anchors certain moments in life - at least in retrospect. I don't usually listen to music (or anything) while writing, but I've done a good deal of plotting while listening to one CD in particular: Jean-Michel Jarre's Rendez Vous. I don't listen to any other electronic music, but for some reason I ended up with Rendez Vous in my collection. I found the length (about an hour) ideal for running an entire "movie" of the plot through my head, even if I had no plot when I started. Plot arcs, scenes, emotions and other details emerge out of nowhere with little effort - no matter what the premise - because the musical pieces themselves form the overall structure of a story. I've tried listening to instrumental movie soundtracks, as they usually include the same broad range of music styles, but unfortunately if I'm familiar with the movie, all my imagination comes up with is that movie. And I can't write at all to music with vocals, as my mind wanders to listen to the lyrics. One of the pieces in Rendez Vous has an interesting history: it features a soulful sax, and was written for astronaut Ron McNair to be played and recorded in space. This never happened - McNair died in the 1986 Challenger disaster. I've been reading Elizabeth Moon's Vatta's War series. 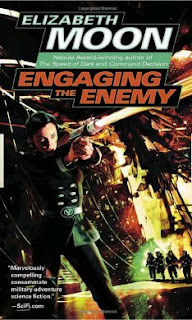 Currently finishing up book 3, Engaging the Enemy. The series revolves around Ky Vatta, daughter of an interstellar trading family, whose father gives her a ship after she's thrown out of Fleet Academy. The ship, though, is bound for the junk yard - not much of a first mission. Everything goes horribly wrong, of course, and by book 3 Ky is not so much trading as assembling a fleet of privateers to take on a bunch of pirates who are menacing the trade routes. The books have a quasi-military feel but are mostly what I label "procedural" - very detailed descriptions of ship life (from the captain's perspective, anyway) including finances, trading deals and other interactions. The first third of the first book, for example, is simply a series of shopping trips to prepare for the voyage. The action amounts to only a handful of incidents in each book. If I've made it sound kind of boring... well, this is not the usual guns-blazing all-out action you might expect from "sci-fi adventure", especially that with a military flavor, but I'm finding the series compelling for a whole other reason. The worlds are incredibly well realized, and it's easy and exciting to imagine what it might be like to live in them. "The Publisher shall consult the Author regarding the cover design..." Thus stateth my contract, and last week my editor asked me for cover ideas, so today I emailed her my "consultation." Basically, that means I scoured Amazon for sci-fi book covers and explained what I liked and didn't like about them. In general I prefer a more stylized cover rather than a "scene from the book". The latter runs the risk of looking out of context and just plain bizarre, or alternatively too generic. I love hardware and hi-tech sci-fi stuff, but that typical "spaceship and planet" concept is wrong for my book. My idea is for something organic (since the story concerns alien ecosystems) merged with technology. If the title sticks, I guess there should also be a beetle on there somewhere. In case the stylized thing doesn't fly, I listed scenes that could be illustrated. This most likely would include the main characters. In the book, I deliberately don't describe them in detail because I prefer books where the reader can imagine someone of their choosing in the main roles. But for the sake of the cover, I did provide descriptions, with photos of two people (a not-so-well-known singer and an even-less-well-known actor) who could (physically) fill the roles of Edie and Finn. Now, of course, I can't wait to see what HarperCollins comes up with! 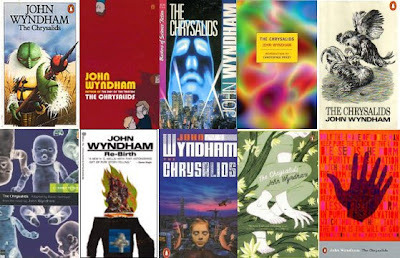 The most outrageous cover I ever owned was for an edition of John Wyndham's The Chrysalids. I haven't read the book in decades but have never forgotten the story. It concerns a post-apocalyptic society in which genetic imperfections are not tolerated. A group of children have to keep their telepathic skills secret in order not to face banishment or execution for this abnormality. The cover depicted... a green ant-lizard-monster.